Born in Scotland on 20 November 1855, he emigrated to Canada in 1872. He was Manager of the J. C. Gibson Machinery Company. He married Eva Wells, with whom he had two daughters: Gladys Gibson (?-1940; wife of J. R. Walker) and Mona Gibson. 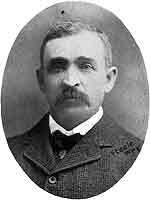 Elected to the Winnipeg City Council in late 1902, he served until 1908, being Chairman of the Fire, Water and Light Department. He was a member of the AF & AM (Ionic Lodge), IOOF, St. Andrew’s Society, and Augustine Presbyterian Church. He moved to Vancouver, British Columbia in 1908, where he died on 4 August 1947.